A soupfin shark caught on a fishing line is released back into the local water. DANA POINT ― Capt. Chris Pica was at it again – helping to untangle a shark. This time, the shark was one Pica has never seen before in the 28 years he has been working as a boat captain. Pica, a captain of Dana Wharf Sportfishing and Whale Watching, was running the sportfishing boat, Reel Fun, for a family’s fishing birthday celebration on June 10. The anglers were catching calico bass, sand bass and had gotten some white sea bass in the weight range of 50 to 60 pounds, Pica said. The line began to pull, and they all initially thought a white sea bass was hooked. The catch ended up being a soupfin shark. Pica estimated the shark to be roughly 100 pounds and around 7-feet long. The shark was a female, Pica noticed, as she didn’t have any claspers. Female soupfins tend to live in Southern California whereas their male counterparts live in Northern California. However they tend to mingle in the central coast. Pica told The Log the shark tried to snap at him and a deckhand as they tried to pull her over the railing. When they got her down on the boat, she started to thrash on the deck. Pica rolled the shark over on her back, secured her head and rubbed her belly. The angler who caught the shark was “a good, ethical fisherman,” according to Pica. The fisherman had no issue setting the shark free. These sharks were overfished in the 1930s and 1940s for their fins and steak. 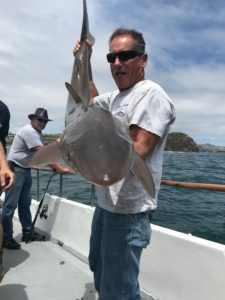 “There is currently very little information about the status of soupfin shark stocks off the West Coast,” the Monterey Bay Aquarium website states. Pica declined to state the exact location where the shark was caught and later released.